Wrestling. You either love the sight of a lot of men – and a few women – flinging each other around a ring, or you don’t. But the sport is one of the oldest in history and grappling to show your physical superiority over another has never really gone out of fashion. Still, it’s a bit silly in places isn’t it? Anyone who’s seen even a glimpse of WWE knows how over the top it can get. Basically, it’s a good target for some really belly laughs. Freshly Ground Comedy have been running their themed Wrestling Spectacular night at The Hancock Pub in Newcastle for a few months now, bringing some of the region’s best comedic talent along to lovingly chat about the sport and, of course, poke a bit of fun at it as well. Ahead of the latest round of stand up sets, wrestling fan and compere Si Beckwith gave us the lowdown on what to expect from the night, if you need to know your Hulk Hogans from your Andre the Giants, to Freshly Ground Comedy’s future plans. Do you have to have any prior knowledge of wrestling before coming to the show? Not at all. I think ultimately, it’s just a bunch of funny people talking about something they are really passionate about, but you could hear a comedian talk about their relationship for ten minutes, and it doesn’t matter that you don’t know their partner, it’s hearing their view on it that’s funny. Wrestling could be a very niche thing to talk about on stage, but I’ve seen all of the acts be able to talk about niche things within sets and still be hugely hilarious and relatable. Don’t expect to leave with any more knowledge of wrestling than you came in with, but you’ll still have lots of fun. You may even learn some things to impress wrestling geeks with, y’know, should you ever be at a point in life where that would be helpful in any way. It’s just going to be lots of silly fun though, and I think everyone can get on board with that. Are all the comedians big wrestling fans then? We are indeed. I’ve been a fan of wrestling for as long as I can remember. In fact, I can still remember the moment I found out wrestling was fake (sorry, spoiler), and it crushed me way more than the news Santa wasn’t real (again, sorry, spoiler). I still keep up to date with it and there are still a few wrestling moments over the last year or so that have turned me into a giddy child. It’s great with the time we’re living in, the internet makes it so easy to find out so much and watch so much, you can gorge on all of the things that you love. I once spent (wasted) a day last year watching every Royal Rumble match back to back. The joys of not having a proper job! All the acts – Carl Hutchinson, Lee Kyle, John Whale, Carl Gillespie and myself – are all wrestling fans, we talk about it a lot anyway, so taking that to the stage is an interesting challenge for some, though both Lee and Carl Hutchinson have one man shows centred around wrestling anyway. Are the performers giving the smack-down on wrestling or is the night more of a loving tribute to the sport? I think it should be more of a loving tribute, though there’s still plenty to mock and be angry about. It’s just nice seeing people enamoured by something, being able to be silly with a thing that they’re passionate about and all finding different ways to convey their feelings about it. It’s so easy being cynical, and fun, but I like the idea of a bunch of idiots talking about something they love. There’s loads of crossovers with stand-up comedy and wrestling too; I think both attract similar people, so we might as well celebrate the fact we’re all a bit odd. Do the performers like to talk about the old days of wrestling or the more modern WWE flashiness? A bit of both I think. We’re all of a similar age, so grew up during similar eras of wrestling, and I suppose have consistently been the age range targeted by WWE (we were all hitting our teens during the attitude era, when it got more “edgy”), up until the point we were supposed to be old enough to know better and start talking to girls and stuff. There’ll be coverage from 80s wrestling through to the modern day. I gigged with Carl Hutchinson this week actually, and got to hear some cracking stories that go from his youth up until very recently. What about Mexican Wrestling? Does that get a look in too? It may well get a mention or two. I mean, at worst, I may just encourage someone to do their set in a luchador mask. When the comedians come on stage, what can we expect? A bit of rousing 80s rock and pyrotechnics? I’ve not checked fire and safety with The Hancock Pub yet, so pyrotechnics may be out. I’ve got a few boxes of party poppers from the pound shop though, so we can improvise. 80s rousing rock is a given, since I have a smashing playlist of such delights on my iPod anyway. I also have Wyclef Jean ft. The Rock, and their song It Doesn’t Matter. That’s getting played at least twice. Lee Kyle is on the bill for this edition of the Wrestling Spectacular; do you think he’ll be cracking any jokes about his previous life as a pro wrestler? I dare say he will be. His one man show at The Stand, Ultimate Worrier, was excellent and covered a lot of those days for him. Only this week though he re-created the entire 1992 WWF Royal Rumble, by himself, as part of Jesterval, so honestly, he could do owt. Is the Wrestling Spectacular going to be a regular event like some of Freshly Ground Comedy’s other showcases? That’s the plan. We (myself and Elliott Clarke) have monthly nights now at The Tower Café, Blake’s and The County Pub in South Shields. We want to make this “comedians talking on a theme” idea a regular show too, maybe every couple of months. We have a film themed show later in the year, a music one too, and some fantastic acts lined up for those. It’s the sort of show I’d want to go to, and that’s what we’re trying to do with all of the shows under the Freshly Ground Comedy banner. Make each one a bit different, but fill each one with funny folk trying something a bit different. Finally, what’s your favourite wrestling-themed joke? There’s a couple from the acts on this show, so I don’t want to spoil anything. That said, there are a couple of rumours about Hulk Hogan that are more entertaining than most of the jokes I’ve heard, so probably just Google them. 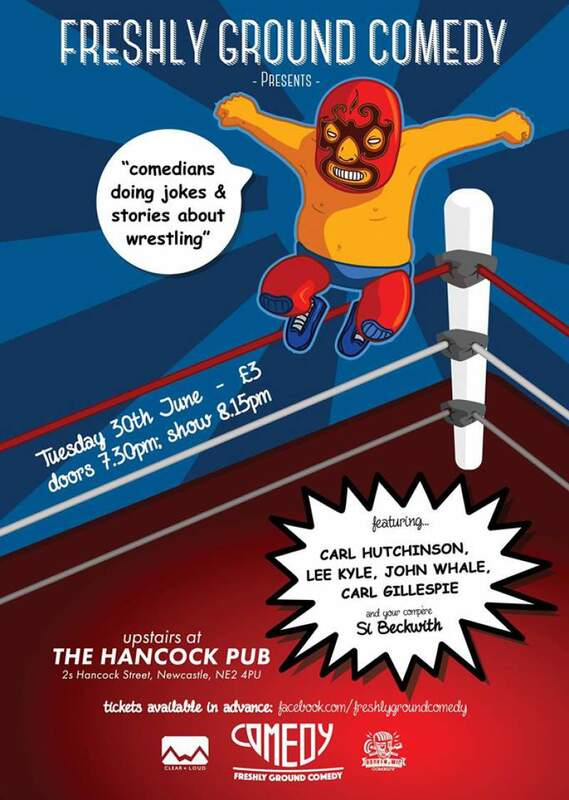 Freshly Ground Comedy’s Wrestling Spectacular comes to The Hancock Pub, Newcastle on Tuesday 30th June.